Font Awesome Icons are already built-in and supported in all ThemeFlood RapidWeaver themes. The purchase of additional RapidWeaver addons (to add support for Font Awesome Icons) is not necessary in our themes. Should you require an extra stack that can accomplish more fanciful effects with Font Awesome icons, the Font Awesome stack from RWExtras is a good choice. Easily add icons next to navigation links, buttons, tabs, labels and table headers etc. Like the Bootstrap toolkit, Font Awesome is already built-into all ThemeFlood themes and available for you to use straight away, should you choose to use it. There is nothing additional that you have to download, install or modify in the theme. Everything you need is already in place and ready for you to use right now! Just make sure you have CSS consolidation enabled in your website settings. At that point, Font Awesome will embed the icon for you in the page, like the one pictured below. In this example, the icon will be 100px tall and coloured red. At that point, Font Awesome will embed the icon image for you in the page, like the one pictured below. Something else you can do is to display Font Awesome icons before or after page navigation links in your website. This is supported in most ThemeFlood RapidWeaver themes. To achieve this, simply type the code for the icon in the Page Title box, in the RapidWeaver Page Inspector (alongside the existing title). The icon will then get rendered before or after the page title, and some themes will automatically hide the icons from locations like the breadcrumbs or footer navigation bar. Icons before page links are useful to give a quick visualisation about what the page is about; for example a home page could have a house icon, and a user can quickly see that clicking that link would take them to the homepage. Icons placed after page links are useful to perform tasks like emphasising that subpage links are available for selection. The screenshot below from the Haze RapidWeaver theme shows some icon-down arrows after some parent page links, used to denote that a drop-down menu of options is available for selection. So as well as being a cosmetic feature, these navigation icons can also help people navigate a website. Unlike some other RapidWeaver themes which force these icons into the page all the time, these icons are not compulsory. You can have complete freedom to choose not to display any icons or choose to use different icon designs. Alternatively instead of Font Awesome icons, you could also make use of HTML entities like arrows, brackets or simple math characters before or after page navigation links. Experiment and see what works best for your particular website. Normal CSS code to change icon colours within the navigation can continue to be used if you prefer. To prevent the code for icons showing in browser window titles, simply ensure every page in your project has a unique Browser Title provided in the RapidWeaver Page Inspector. Note the use of single quotes in the Font Awesome code, instead of double quotes. This is done on purpose to aid RapidWeaver when it generates your site map, and stops the site map becoming contaminated with class or style attributes. Important: In ThemeFlood themes, Font Awesome Icons are configured to only work if you have CSS consolidation turned on in RapidWeaver. If you see squares instead of icons, this is a sure-sign that you've not turned on consolidation, and therefore the links to the icons are broken. If you don't know what CSS consolidation is or whether it is turned on, please read the 10 minute quick start article. Should you have questions about Font Awesome Icons, please contact me first (instead of the original developers). Font Awesome Icons are ignored in IE7 and will not be displayed; this is because IE7 has weak CSS support and does not understand the code being used to display the icons. IE7 is no longer actively developed or supported by Microsoft. Font Awesome 5 was released in early 2018. The basic icon library remains free to use in personal and commercial websites. All new and updated themes we release in 2018 (and going forwards) will be including Font Awesome 5. The icon markup in version 5 has changed slightly (e.g. 'fa' is now 'fas' or 'far'), so you should pay particular attention towards the markup you use for icons. As always, refer to the official Font Awesome website for the complete reference of Font Awesome icons. If you are unsure what version of Font Awesome your theme / version uses, simply look at the specification table, in the sidebar of the theme product page. Cheatsheets for older versions of Font Awesome (like 4.7) still exist online, if you do a web search. 'Pro' versions of Font Awesome are now available; which include more icons in different weights. These 'pro' packs are not bundled in our themes, but you are welcome to buy a copy separately from the Font Awesome website, to add to your website. Why are no icons showing after I update my theme? The most plausible explanation for this occurrence is simply that the markup for your icons may have changed. This is especially true if the theme update you installed moved you from Font Awesome 4 to Font Awesome 5. In Font Awesome 5, many of the markup snippets for icons got changed to 'far' or 'fas'. However, loading multiple versions of Font Awesome is not ideal. This should only be considered a temporary quick-fix. Long term you should go through your pages and update the icon markup to the latest. The theme product page tells you in the sidebar what version of Font Awesome the latest build of the theme includes. Then you can find the relevant Font Awesome reference sheet or cheat sheet online, for the corresponding markup. Another reason for no icons showing is you may have turned-off CSS consolidation. This inadvertently breaks the relative path to the font files. Why do ThemeFlood themes include Font Awesome Icons? Most often because icons are needed for the user interface, of a mobile menu or search bars. The 'hamburger' or 'plus' icon is typically used for the menu toggle. Angle, chevron or arrow icons often get used for indication of child subpages. Sure, there are loads of other font icon libraries available we could have used instead. But Font Awesome is by-far the most widely used and supported library that most developers are familiar with. Font Awesome is also bundled with many other RapidWeaver addons (like Stacks). Our implementation of Font Awesome is provided in such a way as to encourage theme users to make use of the icons too. The complete Font Awesome library is typically included, rather than a smaller subset. Icons like social media are popular to use. Buttons and page links can also be supplemented with icons too. The Font Awesome CSS and font files are all stored within the theme. Our policy going forwards is not make use of CDNs (content delivery networks) to serve Font Awesome Icons. Our implementation ensures your icons will continue to show offline and completed websites are compliant with GDPR and other privacy laws. Save the changes when done and close the file. Working from a duplicated / renamed theme is recommended, if you want to prevent subsequent theme updates undoing your changes. If you would prefer to continue serving your own version of Font Awesome (instead of relying on an external CDN), download Font Awesome from the website. 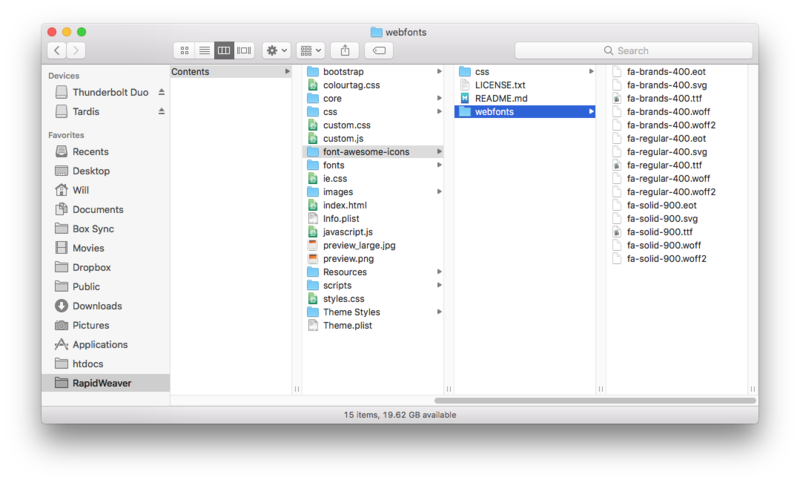 Open the theme contents and navigate into the font-awesome-icons directory. Retaining the original directory and file names as are currently present, replace the existing files with your new ones. The css directory contains the definitions of the icon markup. The fonts or webfonts directory stores the font files. Font Awesome icons are provided in several different font formats, for maximum compatibility with more web browsers.